1. Press the RESET button with stylus to soft-reset your device. 1. Press and hold the POWER button longer than10 seconds immediately after pressing the RESET button. - Pressing the left key of the 5-way navigation key to format user store. - Pressing the right key of the 5-way navigation key to format DiskOnChip. - Press the up key of the 5-way navigation key to format both user store and DiskOnChip. - Press any other key to exit. 1. 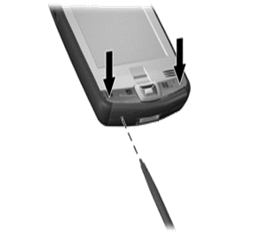 Use the stylus to press the button behind the hole at the left side of the device. keeps the lid in place back in the position as if the back lid would be on. 2. Then keep both the POWER + Capture + End keys pressed while inserting the battery. Power key= The red key on the top of the device. End key= The key with the red phone icon on it. Capture key= The one on the right side of the End key, It has a camera icon on it. 3. If performed right, the device will shake and boot the white start-up H21 screen. and the button above F3 for NO. and the button above F2 for NO. 1. Use the stylus to lightly press the Reset button. 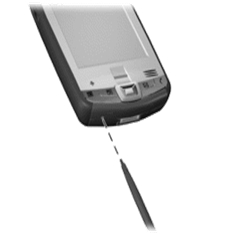 the Reset button on the bottom of the iPAQ Pocket PC for about 2 seconds. and then remove the stylus from the Reset button. 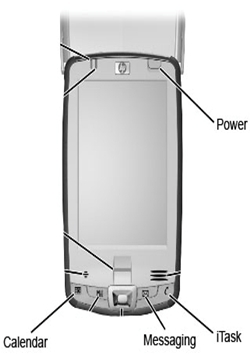 the Reset button on the bottom of the HP iPAQ. and then press and release the Reset button using the stylus. 2. Continue holding the Start/Windows button, OK button, and Record button until a Clean Boot message displays. 3. This indicates successful restoration of factory settings on your device. 1. 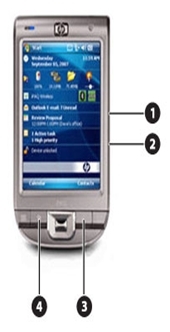 Use HP iPAQ Setup Assistant to simplify configuring settings on your HP iPAQ. HP iPAQ Setup Assistant lets you save the settings on your computer. This can help you restore configuration settings on your HP iPAQ at any time. and view detailed product Information. 1. Tap Start on your device. 2. Then tap Settings > System > Memory > Storage Card . 3. Select iPAQ File Store from the list. 1. Copy all the files to be saved to the iPAQ File Store folder. 2. Tap Start > Programs > File Explorer > My HP iPAQ > iPAQ File Store . 3. Tap Edit > Paste . 1. Hold all the buttons for 2 seconds. 2. Release the Reset button while continuing to hold the Record , Windows , and OK buttons. 3. A Clean Boot message is displayed, indicating successful restoration of factory settings on your device. inside the hole on the bottom of your SoMo 650 and then release. 1. Press and hold the Calendar and Contacts shortcut buttons on your SoMo 650.
inside the hole on the bottom of your SoMo 650. Release the Calendar and Contacts shortcut buttons. Press the two shortcut buttons with the index and middle finger of one hand. Hold the stylus in your other hand to press the Reset button and then release. 3. A Socket Splash Screen will appear and disappear. Follow the onscreen instructions. the Calendar and Contacts shortcut buttons on your SoMo 650.